Last week, it was reported that Colin Kaepernick reached a settlement agreement with the NFL over his grievance case against the league, which charged the NFL and its owners with conspiring to keep Kaepernick off an NFL roster due to his protests and the media attention that came along with it. 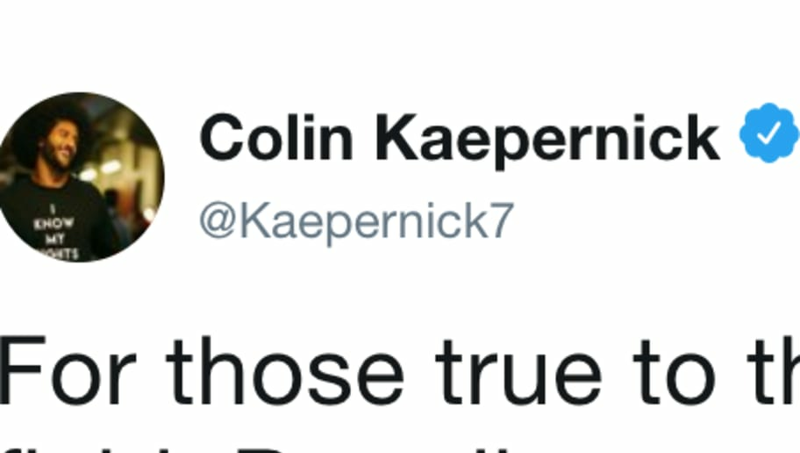 We have yet to hear from Kaepernick since then, and he has been pretty quiet overall since his time with the 49ers ended in 2017, but today we heard from him, on Twitter. Kaepernick tweeted out a photo montage video that shows various people of color sporting black and white Kaepernick jerseys. In most of the video, these people are embracing each other, which is a message Kaepernick wants to promote. Kaepernick also tagged a handful of charities and organizations he supports from either a financial standpoint or a message standpoint. He does call out that "this is only the beginning", which may point to us hearing from the former NFL quarterback more frequently now that his case has been settled and there is no legality to worry about. Only time will tell, but regardless of your stance on Kaepernick, getting more insight into his mindset moving forward should be interesting if or when it happens.